This is my favorite recipe for spaghetti. I usually serve the sauce over spaghetti squash, but I think it's also really good on top of steamed broccoli. Leftover sauce is yummy on or in eggs. For a nutritional boost, lately I've been adding in 1/4 lb ground heart to any recipe that calls for 1 lb ground beef. Heart is just muscle meat, so it doesn't change the taste or texture at all. It's a great way to sneak in some organ meats. Heat the olive oil and brown the ground beef, onions, and garlic over medium heat. Add all the remaining ingredients. Bring to a bubble, partially cover and simmer on low heat for 35 minutes. Cut the spaghetti squash in half lengthwise and scoop out the seeds. Put in a microwave safe container, cover, and cook on high for 10 minutes in the microwave. Leave covered for 10 minutes. Remove squash and string with a fork. If you don't want to use the microwave (this is one of the few things I actually microwave because it's so much easier than the alternative), I would recommend steaming over roasting for this particular dish. I never tried microwaving the squash, but that's an idea I'll try. I usually cut it in half, put either olive or flax seed oil + pepper on it and bake cut-side down. Cooking it first sounds like it is a LOT easier to cut in half. Great idea about the organ meats in the sauce. BTW - made the butternut souffle and the almond meal fried chicken last week. Tasted great; made wife happy. Thanks. Some squashes are hard to cut when they're raw, but that's what I have a big old cleaver for. :) Some of them cut pretty easily though. Glad to hear the butternut souffle and almond chicken went down well! Thanks a lot. 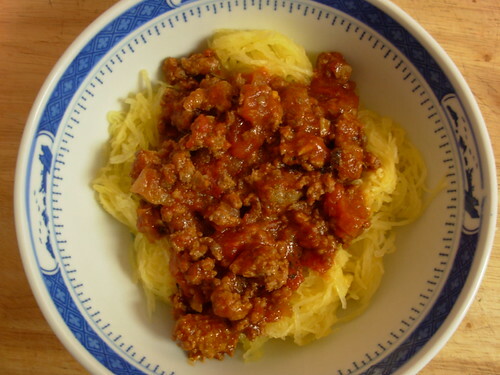 Paleo spaghetti is an interesting recipe. At last I have found something interesting and unique to serve to my guests during the holidays. I am sure that they'll love this Paleo spaghetti. Thank you, as a paleo newbie this is the closest to food I "used to eat" and it tasted great. Will definatly be making again. Our one add to the sauce was zuchini. Thanks again for sharing! This is a great recipe! Thanks for sharing it! I made this today!! They loved it thanks!!! Where do you get organ hearts at if you dont mind me asking? A local butcher perhaps? This is my fav. paleo dish so far! Besides having a hard time cutting the squash, it came out incredible! I look forward to making it again! For cutting squash, at Halloween grocery stores sell little "saws" for cutting pumpkins. I use those year round to saw hard squash in half for baking. Another alternative--puncture it in a few spots then heat in oven for about 20 minutes till it is soft enough to easily cut in half and continue baking. I love this sauce! I'm new to cooking and paleo so this was simple and my favorite dish yet . I think the kick in the cayanne is great touch. I added fresh basil and used zucchini noodles sliced thin and just sauteed them in pan and topped w sauce! No need to even cut the squash. Stab it a number of times (be careful) and throw the whole thing in the microwave for 14 minutes. Done! Thanks for making this with beef! Great recipe, simple, tasty ;)! LOVED this! Thank you for the recipe. Will definitely be making again and again! I just started the Whole30 and was looking for a spaghetti recipe I could eat. Made your Paleo Spaghetti for dinner tonight. It was delicious and so easy to make! Even kids liked it! Thanks for sharing the recipe!